This image shows a comparison of Jupiter as seen in a visible light view taken by astronomer Anthony Wesley (left) and in infrared wavelengths used by NASA's SOFIA telescope during its "first light" flight on May 26, 2010. The infrared view was taken by the FORCAST camera on SOFIA. The white stripe in the infrared image is a region of relatively transparent clouds through which the warm interior of Jupiter can be seen. Full Story. NASA's newest infrared telescope has taken to the skiesto capture its first views of the cosmos from a stratospheric perch ? one thatallows it gaze out a huge hole in the side of high-flying jumbo jet. The telescope, called the Stratospheric Observatory forInfrared Astronomy (SOFIA), took its first photos on May 26 to revealmulticolored infrared views of Jupiter and the galaxy M82. "With this flight, SOFIA begins a 20-year journeythat will enable a wide variety of astronomical science observations notpossible from other Earth and space-borne observatories," said NASA'sastrophysics division director Jon Morse in a statement. "It clearly setsexpectations that SOFIA will provide us with Great Observatory-classastronomical science." The SOFIAtelescope is an infrared 100-inch (2.5 meter) reflecting telescope packedinto the rear of an extensively modified Boeing 747SP jumbo jet. ?A door isopened during flight to allow the 17-ton telescope to observe the night skyfrom above much of the atmosphere that can interfere with observations byground-based telescopes. NASA's Dryden Flight Research Center in California isoverseeing the telescope's operations. The observatory is actually a jointeffort of NASA and the German Aerospace Center. Its research team controls thetelescope from a separate cabin inside the SOFIA aircraft, which is expected tobe in service for at least 20 years. "At its maximum observation ceiling, SOFIA is abovemore than 99 percent of the water vapor in Earth's atmosphere, and so canreceive a large part of cosmic infrared radiation which is otherwise absorbedby Earth's atmosphere," said Paul Hertz, SOFIA's chief scientist forNASA's science mission directorate. For the maiden science flight, the aircraft observatorytook off from its home port at Dryden's Aircraft Operations Facility inPalmdale, Calif.
"Wind tunnel tests and supercomputer calculationsmade at the start of the SOFIA program predicted we would have sharp enoughimages for front-line astronomical research," said SOFIA project scientistPam Marcum of NASA's Ames Research Center in Moffett Field, Calif. "Apreliminary look at the first light data indicates we indeed accomplishedthat." 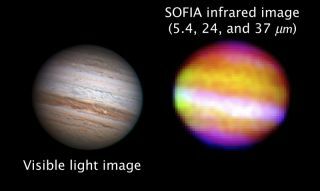 SOFIA's first infrared images of Jupiter and M82 revealedboth objects at wavelengths unobservable by ground and space-based telescopes,SOFIA scientists said. In the Jupitersnapshot, the gas giant planet internal heat can be seen bleeding through holesin its thick bands of clouds. The infrared look at the M82 galaxy, meanwhile, allowedastronomers to peer through the galaxy's interstellar dust clouds and spotseveral so-called "starburst" knots, where infant stars are formingby the tens of thousands. "SOFIA combines the effectiveness of satellite-basedtelescopes with the relatively easy maintenance of ground-basedobservatories," said Alois Himmes, SOFIA project manager for the GermanAerospace Center. "SOFIA is comparable to a space observatory that comeshome every morning." "A preliminary examination of the first light datashows that the images are in fact sharp enough to enable cutting-edge astronomy,"said Alfred Krabbe, director and scientific head of DSI. "Now at last, thefun begins."